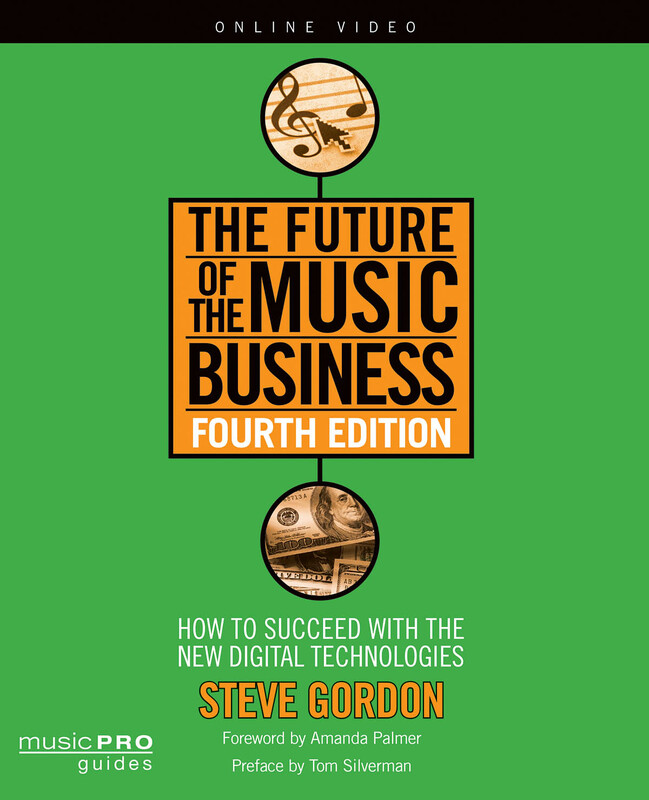 In December, Hal Leonard Books will release the fourth edition of The Future of the Music Business by Steve Gordon, an invaluable guide on how to succeed in the ever-changing music industry. Here’s a look at what’s new in the fourth edition. Similar to prior editions, the purpose of the fourth edition of the FUTURE OF THE MUSIC BUSINESS, which is scheduled to be published in December 2014, is to provide a roadmap for success in the music business – not only for musicians, songwriters and producers – but also for entrepreneurs and industry professionals. Technology has profoundly changed the recording industry and the music publishing business. Entirely new rules, business practices and models have emerged at breathtaking speed including in the several years since the publication of the third edition in 2008. The fourth edition explains the most recent rules, business practices and models, and offers insights into how to take advantage of them. Part I provides an overview of the basic rules and business practices that apply to the record and music publishing business today. We discuss how copyright law protects songs and recordings, standard contracts including management, label and producer deals and the most recent rules and business practices that apply to the new means of distributing music, that is, downloading, streaming and webcasting, and how those rules differ in foreign countries. Part II is intended for producers of audiovisual works such as films, documentaries, and television. This section includes information on audio-only projects such as compilations and music sampling, special projects such as musical theatre and fashion shows, and stand-alone digital projects such as web series and digital sheet music. The emphasis is on how producers seeking music for their projects can save money. Part III offers a history of the recording industry’s struggle to come to grips with the digital era, analyzes the current state of music piracy, explores various current controversies, and provides some hope for the recovery of the record business. Part IV provides a “how to” in the digital age on topics ranging from ranging from how to write hit songs in the digital era to using digital tools such as YouTube to succeed to how to use a music education to succeed as a creator or music business professional. It’s starting to look obvious: sweeping, long-term copyright extensions simply benefit major labels and rich artists, and few others. And that still seems to be the case for soon-to-be-implemented copyright extensions on recordings in Europe, despite some nods to smaller musicians. The quick catch-up: Instead of 50 years, this latest legislation extends it to 70, which saves a trove of valuable 60s masters from entering the public domain. Predictably, big labels and richer-than-God artists were lobbying for this one, with rhetoric and sweeteners tossed towards the struggling musician. But the broader benefit for those artists – and society in general – remains low. In fact, heading into the vote, 8 European countries were seriously questioning the extension resolution. The nays weren’t enough to curb passage in the EU Council in Brussels, though struggling artists were getting out-voted. “Extending the term of protection will however not primarily be of benefit to this group,” Sweden declared. And, Belgium itself was among the dissenters. The others casting doubts included the Czech Republic, the Netherlands, Luxembourg, Romania, Slovakia, Slovenia, and Sweden, with Estonia and Austria abstaining. Keep reading on Digital Music News. The Future of the Music Business provides a legal and business road map for success in today’s music business by setting forth a comprehensive summary of the rules pertaining to the traditional music business, including music licensing, as well as the laws governing online distribution of music and video. Available for purchase here. STEVE GORDON (New York, NY) operates a music clearance service and is an educator on entertainment and copyright law. The recipient of two Fulbright Scholarships, Gordon has taught at Tel Aviv University in Israel and Bocconi University in Milan, Italy, and has also served as adjunct professor at the New School in New York City. He has lectured at many schools and universities, including Juilliard, Wharton, and Columbia University. Hal Leonard Corporation and BCI Media, LLC, are joining forces to create EarDaddy, a subscription video training site aimed directly at the audio, video, and music communities. EarDaddy will offer hundreds of professional video training programs on topics ranging from Music Business, Songwriting, and Instrument Training to Studio Production, Acoustics, and Sound Reinforcement, along with many others. “EarDaddy will fill an online void for a comprehensive, one-stop, reasonably priced video training platform for audio, music, and sound,” says John Cerullo, Group Publisher of Hal Leonard Performing Arts Publishing Group. Although there are currently several online sites providing pay-as-you-go training for the latest music technology titles, purchasers of MIDI and audio software may also be performers, musicians, DJs, songwriters, producers, studio owners, engineers, or teachers. Each of these areas offers opportunities for video training. “You may come to EarDaddy to learn how to use the latest DAW software, but you’ll come back when you see the variety of training that extends to all of the other interests you may have in the areas of audio, music, and sound,” says EarDaddy founder, Brad Smiley, owner of BCI Media. EarDaddy will offer 24/7 accessibility to the site’s content through a low monthly or yearly subscription fee. For more information about EarDaddy, visit the Hal Leonard booth (#364) at the Audio Engineering Society Convention at the Javits Center in New York, Oct. 21-23.